The world's largest democracy and a rising economic giant, India is now as well known across the globe for its mastery of computer technology as it is for its many-armed gods and its famous spiritual traditions. 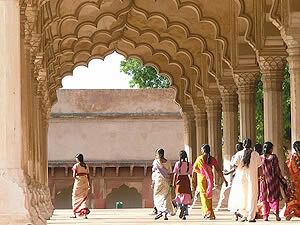 But India is also the world's most ancient surviving civilization, with unbroken continuity back into prehistory. Like other great civilizations—Greece or Egypt, for example—over the millennia it has enjoyed not just one but several brilliant golden ages in art and culture. Its great thinkers and religious leaders have permanently changed the face of the globe. But while the glories of Rome, Egypt, and Greece, have all been the subject of TV portraits, as yet there has been no television story of India on our screens. This series sets out for the first time to do that: to show a world audience the wonders of India; the incredible richness and diversity of its peoples, cultures and landscapes; and the intense drama of its past, including some of the most momentous, exciting and moving events in world history. India's history is a ten thousand year epic but for over two millennia, India has been at the center of world history. It has seen successive invasions from Alexander the Great and Genghis Khan to Tamburlaine and the British, all of whom left their mark but all of whom succumbed, in the end, to India herself. For all that time India has been famous for its spiritual traditions; it gave birth to two world religions, one of which—Buddhism—had a profound impact on all of East Asia, China, Japan and Korea, and in modern times has found root even in the US and Europe. The subcontinent is home to one of the world's greatest—and least understood—artistic traditions and to an extraordinary spectrum of music, dance and literature. India was also, and still is, a great center for technology and science, inventing—for example—the decimal system with zero, which is the basis of all modern science, mathematics and economics. India gave birth to some of the most remarkable characters in world history, including the Buddha, the Mauryan emperor Ashoka, and the Moghul emperor Akbar the Great, not to mention the likes of Nehru and Mahatma Gandhi. Now, in the era of globalization, India has once again become a leading player in the world. Home to more than one billion people it is a land of amazing contrasts: it contains both the high tech brilliance of Bangalore's Silicon Valley and the archaic splendour of the Kumbh Mela festival, where 25 million pilgrims come to bathe in the sacred river Ganges on a single night. While moving at high speed into the 3rd millennium, India alone, of all the civilizations on the face of the earth, is still in touch with her ancient past. In this landmark six-part series for PBS and the BBC, Michael Wood embarked on a dazzling and exciting journey through today's India, "seeking in the present for clues to her past, and in the past for clues to her future".